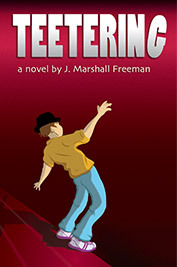 Yesterday I reviewed Teetering by J. Marshall Freeman and today I am happy to have the author stop by Just One More Chapter for a chat. What was the first book you read that really shook you / Is there a specific book you read that made you want to write? Going all the way back to childhood, I think of the books my father read to me, especially the Alice books by Lewis Carroll and Kenneth Grahame's Wind in Willows. But the first book that made an impression and felt like it was MINE was Madeleine L'Engle's A Wrinkle in Time. At an age when a lot of boys were gobbling up Lord of the Rings, I found myself unmoved by swords and battles, but I loved L'Engle's tale of a corrosive enemy whose goal is to make you give up on yourself and conform. There's a lot in that book which strikes me as close to my own work. There is the combination of fantasy and science fiction tropes, the social commentary (some of which went over my head until later readings), and the vulnerability of the protagonists. Like Barnabas in Teetering (and Crispin in the book I'm writing now), Meg is not a likely hero, nor one who would ever describe herself in those terms. It is ultimately her ability to stay true to her core that makes her heroic. As a child and teen, I wrote short pieces from time to time, as well as making short comics, but it was at University of Toronto that I first wrote prose with any kind of seriousness, as well as poetry and plays. However, I switched my focus to music after university and didn't write fiction again until my mid-40s. So, that makes 10 years now of serious writing. What advice would you give younger-writing-you? I would give him advice about life in general: believe that your voice is important and worth expressing. Find allies who you believe in and who believe in you. Don't worry about the critics (external or internal) who say you should be other than you are. The honest writing will flow from this belief in yourself. Also, avoid excessive use of adverbs. Let’s talk about Teetering, without giving too much away, of course. Teetering has a strong theme of young people challenging the structures of society in a positive way. Was this something you had always intended or did it just come out as you wrote the story? Sort of both. I often start a story from a central metaphor. In the case of Teetering, it was the idea that of a city sitting precariously at the edge of a crumbling cliff. From there, I realized that this is a secret being kept from the citizens, one that the protagonist, Barnabas, discovers. Once I had the idea of the authorities misleading the public, I understood that the novel was about the dangers of official secrets and ruling by duplicity. The specifics of the kids' rebellion grew from there. Being true to your metaphor is, for me, the key to writing coherent, resonant stories. Who is your favourite character in Teetering? Ha. I love them all (says the diplomatic parent). There is some truth to this — I can't write a character without loving them — even the villains. Barnabas is so close to me that it's hard to hold him at arm's length and parse my love for him, but it's obviously there. However, the answer to your question is probably Wickram. He was the character I didn't plan (except as generic buddy and foil for the protagonist) and then grew to love… very quickly. Writing him was always easy and fun. I'm drawn to characters who wear their emotions on their sleeves and sometimes act like jerks, despite their basic kindly natures. He is also like many musicians I know, with a way of seeing the world that is wonderfully off-centre and mystifying. What works would you say have influenced your writing of Teetering? I read widely in both "literary" and "genre" fiction, and find the distinction between them to be arbitrary and unhelpful. Or maybe I just avoid works that are tritely genre-based or pretentiously literary and prefer the playful place in the middle. I'm drawn to writers who are whimsically comic and simultaneously tragic. Peter Carey and Salma Rushdie come to mind. I love Ursula K. Leguin, Anne Tyler, Robert Stone, Paul Auster, David Leavitt, Neil Gaiman. I also love to find literary inspiration in other arts. I'm just as likely to be inspired to write after seeing paintings, going to a concert, watching a movie, or reading a comic book. Behind the scenes stories of the creation of art fascinate and inspire me. I am more than halfway through my next novel, whose name at the moment is Blood of the Dragon Groom. It's the first of a YA trilogy called "The Elemental Realms." Like Teetering, it is about a fantastic world adjacent to our real world. As a gay man, writing a vibrant queer teen protagonist has been a uniquely emotional experience. Crispin has a great voice I am privileged to transcribe. Teetering was self-published by your own publishing company, Rabbitfish Editions. 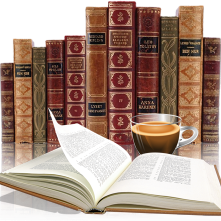 Were you always planning to self-publish this novel? Having gone through it all, would you have made the same choices again? In retrospect, self-publishing seems inevitable. I made some attempts to place the book with publishers, but given the state of publishing these days, and a recognition that I am a control freak, self-publishing was an adventure worth pursuing. (Also, after a handful of rejections, I ran out of patience.) The idea of self-publishing was too scary to contemplate before the book was finished. However, once I was done and believed I had a good novel, I accepted the responsibility of getting it in front of readers. At that moment, "Publisher Jonathan" was born. He's still learning to walk. Yup. The second (and possibly final) book in the series (which has now been named "The Real Education of Barnabas Bopwright") is pretty clear in my head. I will write it after I finish Blood of the Dragon Groom. Look for it in two years. J. Marshall Freeman is a writer, editor, musician, and cartoonist. He is a graduate of the University of Toronto, and a member of the Toronto Writers’ Co-operative. His novel, Teetering, will be released on October 27, 2016. His previous novel, Days of Becoming, was in the realm of fanfiction, written under the name Talktooloose. Upcoming work includes the young adult novel, Copper in the Blood, the novel, The Release Party, and the children’s books, Rhubarb’s Double Life and Holly, Solly, and Blue.